after days suffering from a cold, today I'm a mess as my neck has given up on me. 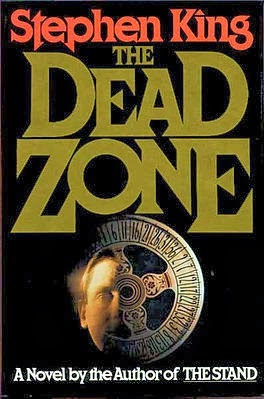 From my twilight zone of dizziness to a serious King zone: It was not my first, but it sure is a pretty good Stephen King. 'It's no joke,' he said. 'It's no joke, you nasty-fucker.' He was light-headed with the joy of naming her, naming her for what she was. The world whirled. Alma broke left, heading for the low railing that surrounded the bandstand, meaning to leap over it. The killer caught the back of her cheap cloth coat at the collar and yanked her back again. The cloth ripped with a low purring sound and she opened her mouth to scream. He threw her to the board floor. His hand came off her mouth, which was now smeared with blood, and she opened her mouth to scream again, but he landed on top of her, panting, grinning, and the air was driven out of her lungs in a soundless whoosh. She could feel him now, rock hard, gigantic and throbbing, and she quit trying to scream and went on struggling. Her fingers caught and slipped, caught and slipped. He forced her legs rudely apart and lay between them. One of her hands glanced off the bridge of his nose, making his eyes water. 'You nasty-fucker,' he whispered, and his hands closed on her throat. He began to throttle her, yanking her head up from the bandstand's board flooring and then slamming it back down. Her eyes bulged. Her face went pink, then red, then a congested purple. Her struggles began to weaken. 'Nasty-fucker, nasty-fucker, nasty-fucker,' the killer panted hoarsely. He really was the killer now, Alma Frechette's days of rubbing her body all over people at Serenity Hill were done now. Her eyes bugged out like the eyes of some of those crazy dolls they sold along carnival midways. The killer panted hoarsely. Her hands lay limp on the boards now. His fingers had almost disappeared from sight. He let go of her throat, ready to grab her again if she stirred. But she didn't. After a moment he ripped her coat open with shaking hands and shoved the skirt of her pink waitress uniform up. The white sky looked down. The Castle Rock town common was deserted. In fact, no one found the strangled, violated corpse of Alma Frechette until the next day. The sheriff's theory was that a drifter had done it. There were statewide newspaper headlines, and in Castle Rock there was general agreement with the sheriff's idea. Surely no hometown boy could have done such a dreadful thing."